April is National Donate Life Month and a good time to remind people that organ donation is not just something you agree to upon your death. The 14,000 to 17,000 people currently on the waiting list for a liver transplant don’t need to wait for a donor to die, you could donate today. Liver transplants offer a unique option for a sick patient, a living liver donor. Despite increased awareness of organ donation and the pressing need for donors, people with end-stage liver disease continue to die while on the waiting list. Approximately 25 percent of people on the waiting list die before receiving a transplant. A living donor program, like the one recently opened at UPMC Susquehanna, is a step in the right direction to saving more lives. Your liver is essential for keeping your body healthy. Anything that is consumed, whether it is food, alcohol, or medicine, gets filtered by your liver. Your liver can flush toxins from the body and can also store vital nutrients and release them into your blood. When your liver isn’t functioning, it can affect your whole body. Sadly, when it comes to the health of the liver, the people in northeastern and central Pennsylvania don’t score high marks. In fact, Pennsylvania ranks seventh out of 50 states for the number of deaths each year from chronic liver disease. Many of these patients are very sick, and some of them are in need of a transplant. One common misconception about liver disease is it is self-inflicted. Although it is true sometimes a person’s lifestyle can contribute to liver disease, that isn’t always the case. Other factors in liver disease include genetics, autoimmune disorders, and long-term use of certain medications. A human liver is about three pounds and the size of a football. Living liver donors give anywhere from 30 to 60 percent of their liver to the recipient. The liver cells regenerate until it has regrown to almost its original size in both the donor and recipient. A liver can fully regenerate in eight to 10 weeks. You do not need to be related to donate a liver to someone. Living donors can be family, friend, or anonymous donors-you just need to be a blood type match and meet some other requirements. – Between the ages of 18 and 55. – In good general health. – Have no history of heart disease, liver disease – including cirrhosis and hepatitis B and C, diabetes, HIV, cancers, or other disease that could complicate surgery. There are some risks to becoming a living donor, and it is important anyone considering undertint those risks. It is a big decision, but it can also save a life. If you have been diagnosed with liver disease or are considering becoming a living donor, visit UPMC.com/LivingDonorLiver to learn more about living donation. 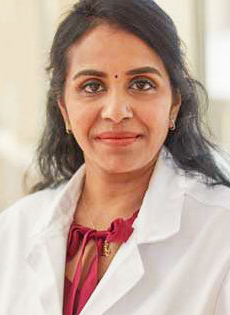 Dr. Ganesh is renowned for her clinical expertise in treating a wide range of patients with liver disease and is committed to raising awareness of living-donor liver transplantation. Her areas of research include evaluating patients with liver disease, assessing their eligibility for living donor surgery, managing patients on the waiting list, and developing disease management protocols in post-liver transplant patients with metabolic syndrome, hyperlipidemia, and systemic hypertension.